Much of human behavior is directed toward goals: finding food, selling services, curing cancer, making meaning. Achieving goals requires action. Action requires effort. Effort requires energy and attention applied over time. Effort overcomes obstacles. Obstacles tax our patience, sap our resolve, and cause us stress. This job is not worth the stress. It all takes its toll. These metaphors suggest an economics of human behavior—a framework for understanding the human cost of living and the trade-offs we make momentby- moment as we choose one course of action over another. This paper begins the development of such a framework for everyday living and suggests how it might be applied to business and design. The authors hope to provide a means for us all to learn to act in better accord with our interests and thereby improve productivity and satisfaction, both individually and in concert with others. All of life’s activities carry some bio-cost. Most often, we “feel” bio-cost when we meet resistance—when we can’t enter a flow and act simply to get what we want. We experience the drain of bio-cost every day— when we find a stone in our shoe; when traffic slows us; when we struggle to change a channel with a remote control; when the bureaucracy requires we submit another form; when the boss makes contradictory requests; when the stock market sends mixed signals. Bio-cost limits what we can achieve because we may not have the resources to get what we want, or we might spend too much for what we get in return. This is true for individuals, groups, organizations, and species. While we may not be able to quantify bio-cost with precise measures— whether in anticipation of expending it or after the fact—the authors have found considerable utility in construing bio-cost as comprising distinct quantitative components. All tasks take time to accomplish. The effort required to complete a task can be mapped against time (in basic cases, at least). 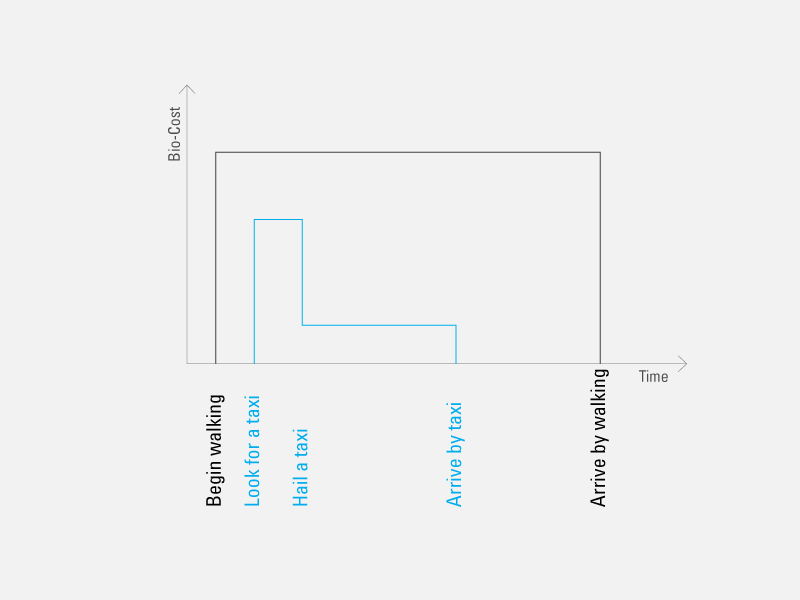 Graphing against time we see an ebb and flow of effort—e.g., walking to a destination requires relatively constant bio-cost expenditure over time, while flagging down a cab and getting in requires an initial burst of effort followed by a period of relative rest during the ride, as in Figure 1. In the case above, the physical effort can be measured as calories—the greater the effort, the more calories required. There are limits to our physical efforts; when taken to an extreme, we can experience muscle fatigue or exhaustion. Bio-cost also has a mental component. Mental effort means attention paid to perform a task or even to think about how to perform it. As with physical effort, this use of our brains and all the components of our nervous system that coordinate our thinking and acting also requires effort and also has limits. Some tasks require more concentration than others, so the attention we pay will vary. Similarly, we reach emotional limits as palpable as physical and mental ones when we get “stressed out” due to factors such as uncertainty and fear. Because the chemical and hormonal pathways overlay the nervous system, feeling has impact on thinking and vice versa. [von Forester 1973] A second-order awareness of the toll that a task is taking—whether in physical, mental, or emotional terms—may add further stress or alleviate it. This becomes part of a feedback loop that helps us to estimate the bio-cost expenditure required to be successful. When the task is to “save our life”— for example, to undergo invasive surgery to remove a tumor—our stress is increased because the stakes and uncertainties are high. When there are negative consequences for not completing a task by some deadline, such as getting to the airport in time to board a flight, perceived limitations of time can contribute to stress. Even non-time threatened situations raise our stress levels: Will I get fired for that mistake? Will I pass the test? Will she like me? Can we replenish our “reserves”? Clearly, we cannot recover time once spent, but given more time, we may be able to replenish our energy, our ability to concentrate, and our capacity to absorb stress. Sleep appears to restore our energy, refresh our brains, and reduce our stress such that we can use our time more efficiently and make better choices. Many other activities also fit this category, such as meditation, the pursuit of sports, crafts, and the arts, or even mastery of a skill. How do we assess bio-cost trade-offs? In monetary transactions we commonly consider cost versus gain. This paper argues that the same is true for actions that involve the expenditure of physical, mental, and emotional effort, and that explicit awareness of this affords us the opportunity to reflect on trade-offs and improve the choices we make. It is important to keep in mind, however, that we can’t always easily calculate the value of reducing bio-cost in monetary terms nor can we translate or commute a given valuation to other circumstances or individuals. Still, we maintain a belief in the gain and a sense of the cost, and we remain capable of generating an opinion as to what we will base our actions on right now. Put another way, we think the view is worth the climb. In order to characterize a progression of variations of goal setting, taking action, and reaping rewards, the next set of figures start from a single participant and proceed to cover cases of cooperation and collaboration with others. 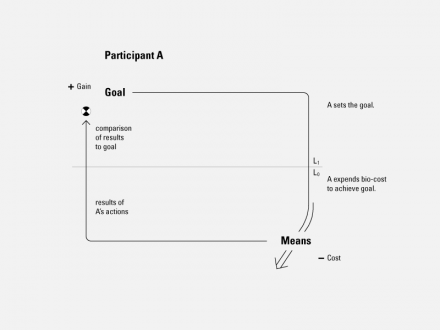 Figure 2 draws from Pask’s model of goal/action systems [Pask 1975; Pangaro 2003], reinterpreted such that the “goal” level (L1 in Pask’s original) becomes the gain, while the “means” level (L0 in the original) becomes the cost. Per Pask, the goallevel controls the execution of procedures at the means-level, as indicated by the vertical arrow on right side. Results from execution are returned and compared to the original goal, as indicated by the line on the left with comparator sign. Figure 2: First canonical form shows goals are achieved via separate means, where the means has a cost and achieving the goal creates a gain. 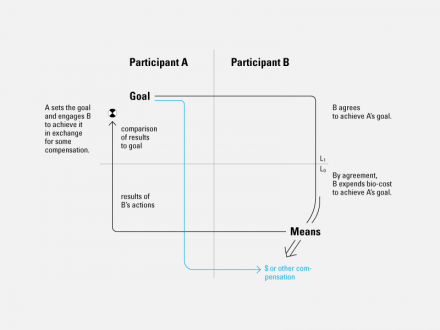 The next case involves a distinction between Participant A, who sets the goal, and Participant B, who agrees to perform the actions required to achieve that goal. The components are the same as in Figure 2. 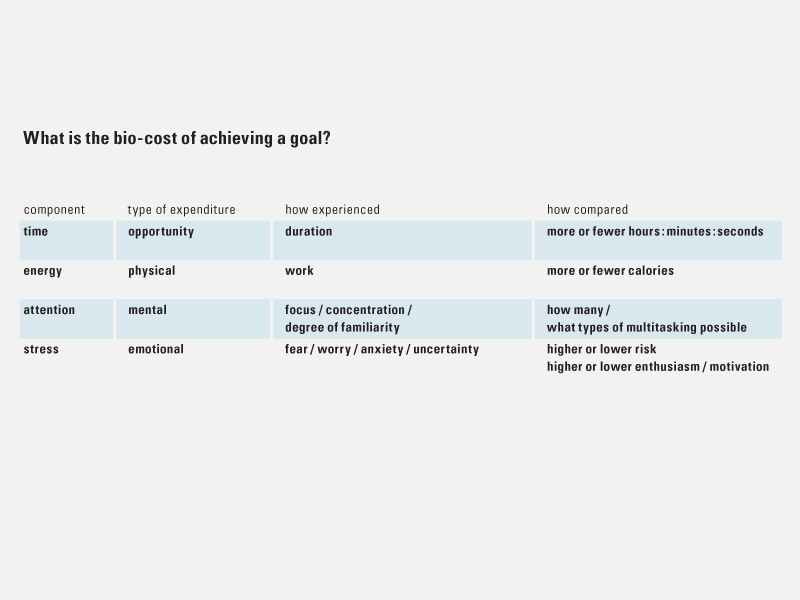 However, in Figure 3, there is a clear division (the vertical line) as goal-setting and action-taking are executed by different participants. Participant B expends the bio-cost to achieve the goal on behalf of Participant A, who compares the result of B’s actions with the goal. We call the interaction cooperation” because there are clear roles and actions for A and for B—they co-operate, that is, they operate together but within agreed boundaries. 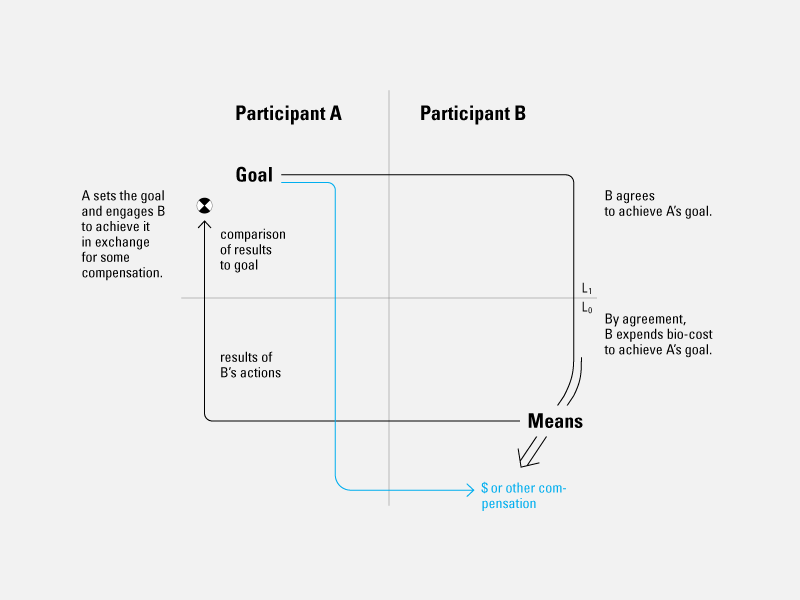 Figure 3: Second canonical form shows the allocation of goal-setting to Participant A, and action-taking to Participant B. The third case also involves two participants but is more open-ended in that the distribution of roles and actions between participants is not predetermined. 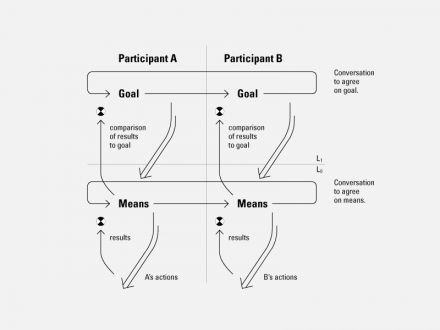 Rather, participants A and B collaborate— they “co-labor” or work together—to create and agree on the goals themselves, as well as to agree on who does what to achieve them. 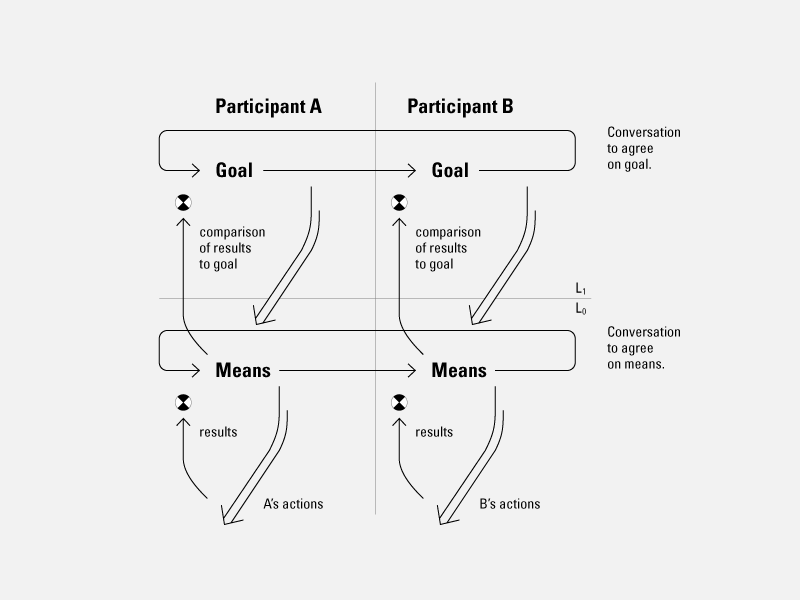 In Figure 4, participants A and B converse at two levels: about goals (upper horizontal loop) and about the means to achieve them (lower horizontal loop). They likely also cooperate about means, and use feedback to check whether goals have been achieved (loops that cross from upper to lower level). In an ongoing collaboration, participants may maintain some sense of the trade-offs across time and situations, and they may seek a balance over time. 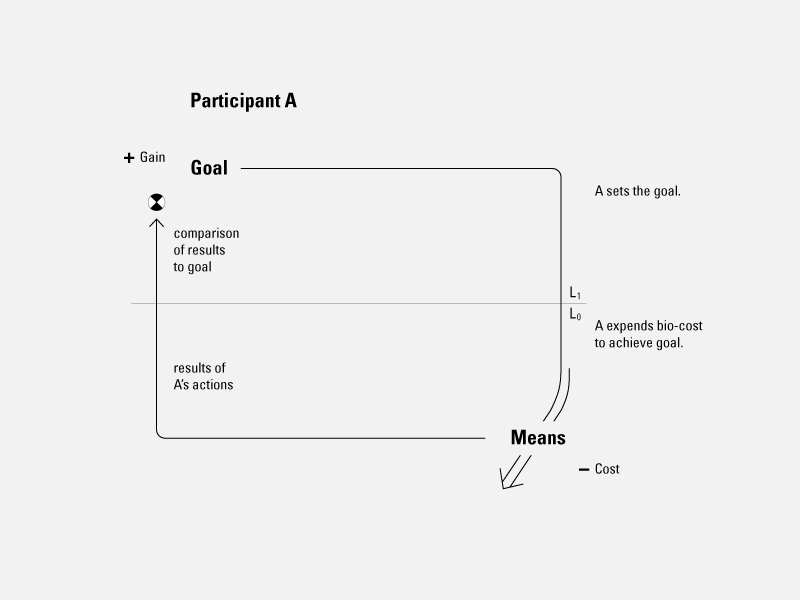 Figure 4: Second canonical form shows the allocation of goal-setting to Participant A, and action-taking to Participant B. Third canonical form shows that A and B “co-labor” to create goals and share bio-cost to achieve them. Society has benefitted greatly from—one could say society can arise because of—the sharing of bio-cost. As early as the Stone Age, social groups learned how coordinated action could achieve goals that would otherwise have been impossible. A group could successfully hunt a swift and powerful animal for food, whereas a single hunter might have only a slim chance of success and a high risk of injury or death. By sharing such responsibilities, groups could achieve net bio-cost reduction thereby freeing up resources to explore new lands, create new arts and cultures, and develop new means of associating and collaborating. On the other hand, “strong teamwork” means that there is mutual trust (itself a huge bio-cost reducer) as well as clarity of direction, role and proper action (all proxies for low uncertainty and hence low bio-cost situations). At best, the beliefs and goals of the individuals in a corporation are highly aligned. In addition to applying the framework of bio-cost to organizational design, we can also apply it to product and service design. Minimizing or at least reducing a user’s bio-cost can be an important design goal. Even though the precision of bio-cost measures is limited, a focus on bio-cost permits a deep conversation during the design process. Instead of seeking to make products “simple” or intuitive”—laudable goals but not very specific— designers can use the dimensions of bio-cost to participate in a more directed design process where trade-offs are made explicit and clear. We see an opportunity for organizations to create value by focusing on bio-cost. 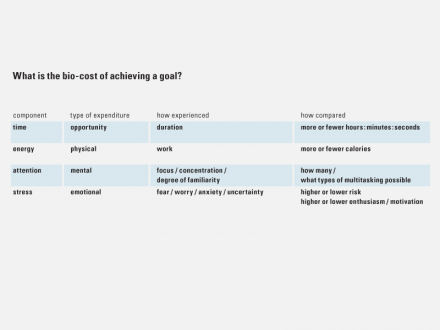 First, bio-cost provides a framework for improving productivity; by getting better at understanding bio-cost, we can get better at reducing it. In addition, bio-cost provides a framework for innovation; identifying bio-cost is identifying inefficiency, identifying an unmet user need, identifying an opportunity for new products and services. even lower bio-cost—a positive feedback loop and a virtuous cycle. Reducing bio-cost creates value. It expands the space in which additional choices may be generated and evaluated. It can be an ethical motivation in the design process and lead to a more humane world. We believe that a bio-cost economy underlies all exchanges of value, and it always will, because it involves the management of the least fungible and most valuable aspect of life: how we spend our time. I love the idea of bio-cost and the approach you are advocating. I’m very interested in sustainability and have been exploring ‘human energy used’ by services as a proxy for social sustainability, alongside measures such as carbon emissions used (environmental impacts) and time use (financial/ economic impacts). 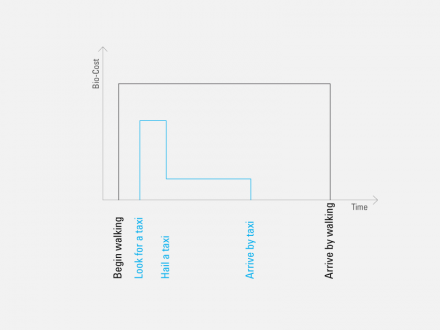 I started with the methods I use as a design researcher and service designer – mostly because getting data was easiest and offered the quickest way to learn. As you point out, I’ve noticed my conventional design research methods have a lower bio-cost and higher carbon emissions – because this configuration is easy in our culture. And as I’ve evolved into more collaborative, socially sustainable methods, the initial effort clearly comes with a higher bio-cost and lower carbon emissions. It also comes with higher immediate gains for client and stakeholders. On balance, the ‘cost of change’ seems to be in favour of change (from the client’s view anyway). The hope (gamble?) is that clients will be motivated by the higher gains to apply the collaborative methods more fully, so moving into lower bio-cost/ lower carbon emission/ higher gain approaches. But it’s early days and the results are mixed. On the one hand, a favourite client is using the above work to develop a ‘collaborative design’ template for sharing with similar organisations – a good result. On the other, as you’d expect, it’s often hard to capture the bio-value of ‘simplicity and time saved for users’. It’s not just a case of data capture, but also a case of capturing the value to the organisation. To put this another way, business models tend to treat bio-cost (and other user ‘stuff’) as an externality, so the background challenge is to capture its value within and to the organisation. I love this stuff and believe it is a profoundly useful way of approaching service design. Please keep working with and developing this approach!